AngularJS is a part of this new generation of libraries and frameworks that came to support the development of more productive, flexible, maintainable, and testable web applications. To initialize AngularJS we just need to place the ng-app attribute with the module's name inside the html element or any other element that surrounds the application. We have already setup the framework and it has been initialized what we need next is to take it for a spin. We have just imported the AngularJS library and initialized it. Let get our hands dirty by creating a mini login Application with AngularJs. Next we need to create a controller for our application and register it with AngularJs. 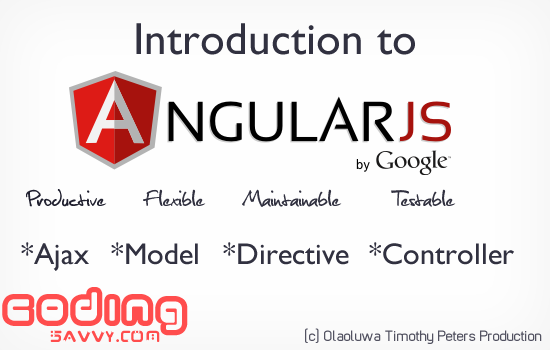 Before we go further I will like us to get to know about AngularJs Directives and How to use them . A directive is an extension of the HTML vocabulary that allows us to create new behaviors. This technology lets the developers create reusable components that can be used within the whole application and even provide their own custom components. The directive can be applied as an attribute, element, class, and even as a comment, using the camel Case syntax. However, because HTML is case insensitive, we can use a lowercase form. For the ngModel directive, we can use ng-model, ng:model, ng_model, data-ng-model, and x-ng-model in the HTML markup. To use AngularJs Controller with our view we need to bind it to an element in our HTML file. In our case let bind it with the body tag we are going to achieve this by using the ng-controller directive which is an AngularJs in-built directive. Note: We can also create our own directives and we are also going to cover it in this tutorial. Next we proceed to creating the login function that will be triggered by the login button. To create our login function we create the function and save it in our $scope parameter. Next we need to access the user input to the form with AngularJs. The model of angularjs framework is referring to the source of data. In our user login application we need to begin by the username and password field added to our model using ng-model directive. Next we need to validate the inputed data. First we need to give our form a name and remember that all the input fields must have their names too. The validation process is quite simple and relies on some directives to do the job. The first one that we need to understand is the ngRequired directive. This directive is usefult if a form field is required before the form will be submitted. we can add a regular expression to validate the format of the username or password field by adding this directive to the fields. The result can be evaluated through the implicit object $valid. It will be defined based on the directives of each field. To make sure that the user requesting to login has passed the validation test we can disable the login button and enable it if the user passes the tests. To make sure that the user interacting with our application understands what is going on, we need to repore an error whenever users don't pass the form validation tests. This will bring us to learn how we can create our own custom directives. We want or errors to look something like this. we can add body to our directive like this. The replace is used to replace the already existing elements in our directive position this is essential if we need to replace the original element. We attached our previous in-built directives by defining it as an attribute of the element. However, when we create a new directive as a reusable component, it doesn't make much sense. In this case, a better approach can restrict the directive to be an element. Now we can place our directive anywhere by just pitting this code. Now we need to send error messages into our component to replace the hard coded once. This prefix passes the data as a string. This prefix creates a bidirectional relationship between a controller's scope property and a local scope directive property. This prefix binds the parameter with an expression in the context of the parent scope. It is useful if you would like to provide some outside functions to the directive. Server communication is one of the beauty of AngularJs framework , the request is faster and it is easy to render. Let use php to generate the JSON data. $scope.message = "You must be authenticated!" Here are some common error codes in HTTP request. let position the registered users table beside the login form. Great post. I really learned some new things in here. So thanks. You are welcome Lucy, Am glad it helps.